The World's Most Affordable CD / DVD Printer. Hands-Free Production of DVDs and CDs. Have you ever had to print discs one at a time and apply sticky labels? If so, you know how much time and effort is involved. Even ordering discs from an outside vendor takes too much time and is too expensive. You’ve probably thought to yourself, “There has to be a better way!” Now, there is. It’s the Bravo™ SE Disc Publisher from Primera. Bravo SE is a compact, all-in-one automated disc printer that fits right on your desktop. It produces full-color, high-quality discs that make your business or organization look truly professional. he Bravo SE AutoPrinter is an all-in-one disc printing system. Bravo SE automatically prints full-color, 4800 dpi images directly onto the surface of CDs and DVDs. 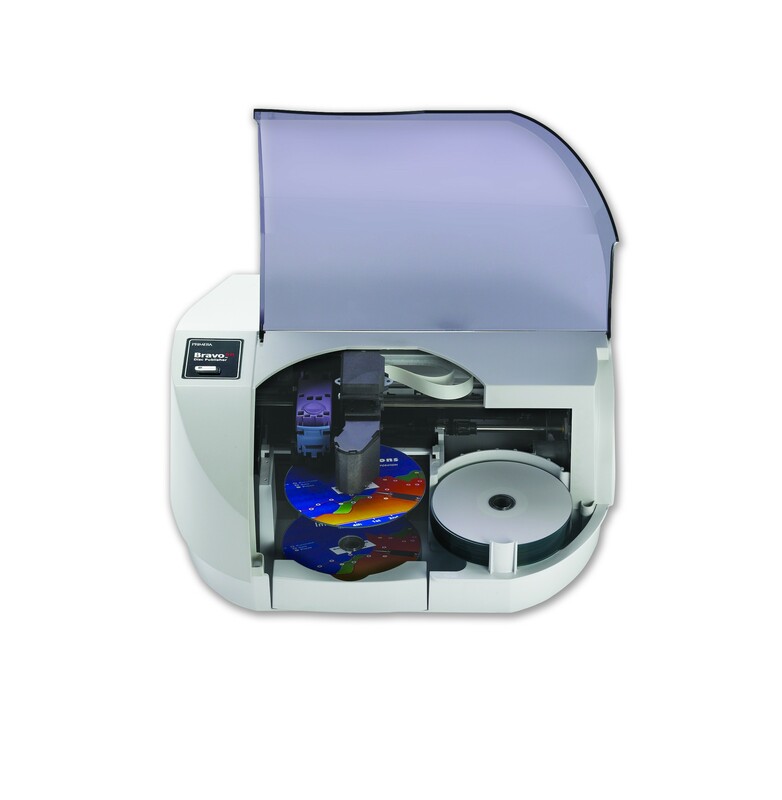 The Bravo SE AutoPrinter produces gorgeous, full-color CDs and DVDs in jobs of up to 20 discs at a time. It automatically feeds discs into and out of the printer and is the perfect companion to the tower-style duplicator you may already own - all for a price that's about the same as other manual disc printers! You can use virtually any printable-surface DVD±R or CD-R media. For ultimate performance, try Primera’s TuffCoat™ with AquaGuard™ surface (matte finish) or TuffCoat with WaterShield™ surface (glossy finish). Both are highly water-resistant and produce the most professional-looking discs you’ve ever seen! Primera distributes its products in more than 80 countries and manufactures more automated disc publishers than any other company in the world. You can be confident that you’re in good company when you buy Primera! Models Bravo SE AutoPrinter (No drives, for printing only) Disc Capacity 20 discs Print Method Inkjet Print Resolution Up to 4800 dpi Maximum Print Width 4.724" (120mm) Ink Cartridges Cyan, Magenta, Yellow cartridge, Primera P/N 53332 Colors 16.7 million Color Matching Z-Color™ color profile included Software For the PC: SureThing™ CD Label Software Primera Edition For the Mac: EPS design templates for Mac® and Windows users Media Types Printable-surface DVD R and CD-R; standard or water-resistant Minimum System Requirements for PC For PC: Pentium III processor at 700MHz or higher, 500MB or more RAM, available USB 2.0 port, NTFS drive partition Minimum System Requirements for Mac Computers For Mac: Intel Solo or Duo Core™ processor, 256 MB or more of RAM, available USB 2.0 port, 10 GB free hard drive space (for temporary DVD images) Operating Systems Windows XP/Vista®/7 for PC OS X v10.5 or higher for Mac Electrical Rating 12VDC, 5A Safety UL, UL-C, CE Emissions FCC Class B, CE Power Requirements 100-240 VAC, 50/60Hz, 60 watts Weight 11.5 lbs. (4.1 kg) Dimensions 15”W x 14.75”H x 7”H (381mmW x 375mmH x 178mmH) Data Interfaces USB 2.0 Options CD-R/DVD±R Media: • TuffCoat Plus (white, standard printable surface) • TuffCoat with WaterShield surface (glossy surface, water-resistant) Warranty One year parts and labor; optional Extended warranties available.